OUAT - How is Mr. Gold spending his Valentine's Day? OUAT – How is Mr. Gold spending his Valentine’s Day? In a previous blog post, we asked how David might be spending Valentine’s Day and who may or may not be receiving a Valentine’s day card from him. In one of the Sneak Peeks of the OUAT Episode “Skin Deep” we saw that while David was purchasing the cards, he runs into Mr. Gold also making a purchase. 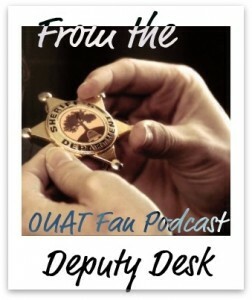 We see that Mr. Gold is purchasing duct tape and ropes. 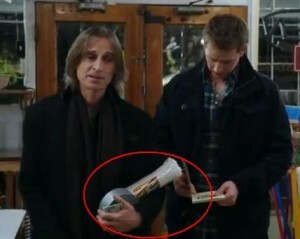 What do you think Mr. Gold is planning to do with these items? How will those items be used for his Valentine’s Day? This entry was posted in Uncategorized and tagged abc, abc tv, David Nolan, disney, disney connections in once upon a time, duct tape, greeting cards, Josh Dallas, Kathryn, Mary Margaret, mr. gold, once, once upon a time, Prince Charming, Robert Carlyle, ropes, Rumplestiltskin, Sneezy, Sunday, tv series on February 10, 2012 by deputies. Maybe his going to tie up his date so she can not go home.